The papers in this volume report on the analysis of standard process mining data sets by different research groups. The papers were submissions to the 3rd international Business Process Intelligence challenge which is organized yearly in conjunction with the Business Process Intelligence Workshop. In this challenge, participants are provided with real-life event logs, and are asked to analyze these data using whatever techniques available, focusing on one or more of the process owner's questions or proving other unique insights into the process captured in the event log. For this year, we prepared an event log from Volvo IT Belgium. The log contains events from an incident and problem management system called VINST. We provided the participants with the original CSV file as well as three event logs that were extracted from this CSV file with the incident or problem number as case ID. Push to Front (incidents only) Is there evidence that cases are pushed to the 2nd and 3rd line too often or too soon? Ping Pong Behavior How often do cases ping pong between teams and which teams are more or less involved in ping-ponging? Wait User abuse Is the "wait user" substatus abused to hide problems with the total resolution time? Process Conformity per Organisation Where do the two IT organisations differ and why? The process mining technology in Fluxicon's products can automatically create smart flow diagrams of your process. All you need are event logs that are already on your IT systems. Because our products work with this objective information, you no longer need to rely on belief or hearsay - you will know what's going on. Through the recent purchase of Pallas Athena, Perceptive Software has become a world-leading Business Process Management Software (BPM) and Solutions provider. Their innovative software platforms and user-friendly designs are well known and recognized throughout the industry. In these proceedings, all submissions are included as they were submitted to the challenge. The jury evaluated all submissions on completeness of the analysis, presentation of the results and originality. A selection of the jury's comments on the submissions together with an abstract of each submission can be found in the summary. Their report was found to be complete, repeatable and thorough, while maintaining a proper mix between general data analysis techniques and real business process intelligence techniques. During the BPI workshop 2013, the prizes were handed over to the first author of the winning submission. 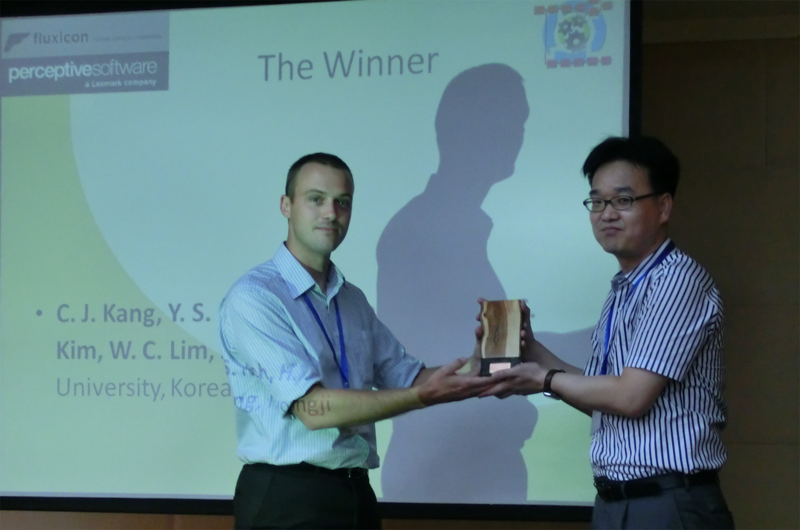 Award ceremony at BPI'13 showing Prof. Kang (right) receiving the BPI 2013 trophy from the organizers.